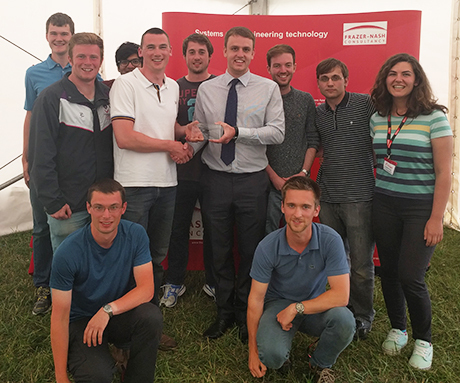 A team of students from Loughborough University won both the Frazer-Nash sponsored 'Design' award, and the overall prize, at the Institution of Mechanical Engineers' (IMechE) Unmanned Aircraft Systems (UAS) Challenge. Seventeen teams entered the competition including, for the first time, an international team from Egypt. The Challenge asks groups of undergraduates and masters students to undertake a full design and build cycle for a UAS over a period of nine months, culminating in a final 'fly-off' and judging, which took place this year on 6 and 7 July. Competitors fly their craft on a 'mission' via pre-planned waypoints, to drop two payloads representing humanitarian aid as quickly and accurately as possible onto a ground marker. Packages must land intact and, to score maximum points, the team's UAS also has to identify an alphanumeric code located within the target area. "After competing last year it was good to see this year's event from a new perspective, as a Scrutineer/Judge. There has been a dramatic step change from the inaugural event - reflecting the immense efforts that the students, academics and industrial support have put in. It's shown both in terms of the quality and efficiency of the UAS platforms, and their ability to perform their required objectives. "It was great to see so many ambitious and driven individuals taking the reins on their professional development by exhibiting their technical and commercial skills on a stage in front of industry representatives. "The entrants showcased great levels of teamwork, leadership, and professionalism throughout the event - which led to numerous successful flight demonstrations of innovative UAS solutions."